Goat anti Mouse CD184 / CXCR4 recognises an epitope within the N-terminal (NT) region of mouse CD184, otherwise known as CXCR4 (C-X-C chemokine receptor type 4), a transmembrane glycoprotein and member of the G-protein coupled receptor 1 family, ubiquitously expressed in blood and tissue cells, which acts as a specific receptor for the chemokine SDF-1 (Stromal cell-derived factor 1). Interaction of CD184 with SDF-1 mediates the chemotaxis of progenitor and mature blood cells, and is critical for B-lymphopoiesis and myelopoiesis. CD184 is a major co-receptor for infection by T-cell tropic strains of HIV1, and also a primary receptor for some HIV2 isolates.  This antibody is reported as being suitable for use in immunocytochemistry on mouse spleen leucocytes. Antiserum to mouse CD184 / CXCR4 (NT) was raised by repeated immunisation of goats with highly purified antigen. Purified IgG was prepared by affinity chromatography. Synthetic peptide YSEEVGSGDYDSNKEPCFRDENVHFNR corresponding to amino acids 14-40 within the N-terminal region of mouse CD184 / CXCR4.